25: IN THE BEGINNING WAS THE WORD. 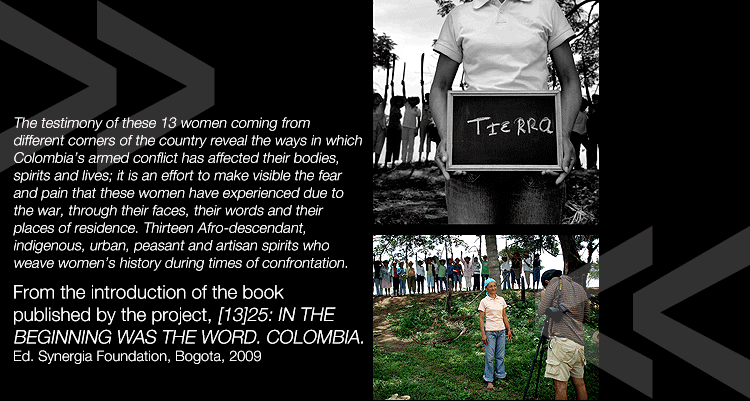 COLOMBIA: view the project (to read the accompanying texts, click on each image). Or: Follow this link to read the project in pdf format. This project was carried out by the Dutch NGO Cordaid and directed in Colombia by the Synergia Foundation, within the framework of its “Women and Violences Programme”. The project states: the very existence of this project corroborates the fact that the Colombian State has not protected these women in conflict zones against gender violence. They have had to recover and rebuild their living space anew, all on their own. 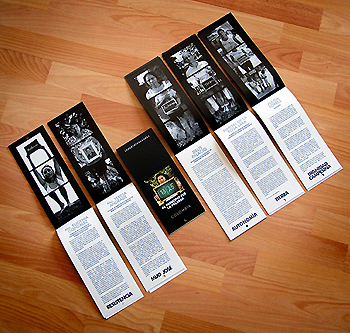 In Colombia, the project’s aim has been to raise awareness and empower Colombian feminist organisations with respect to Resolution 1325, as well as creating new materials (a book, the photographs and texts reproduced on very large posters to be placed on the street). Two additional aims were to raise awareness about the Resolution among the public in general, and for Cordaid to lobby before both the Dutch and the European Parliaments regarding the human rights situation in Colombia, the violence affecting it and the outrages caused to civil society. Carrying out this project generated the activation of a Cordaid emergency relief fund, to be used in the event any of the 13 women involved in it suffered violence or threats, given the fact that many had previously been threatened by military, paramilitary or guerrilla forces. This project achieved its mission: to empower the women involved in it and the women´s organisations taking part in it: watch here a video of the moving tribute paid to these women by Colombian Women´s Organisations, a tribute which was entitled Thirteen Moons.